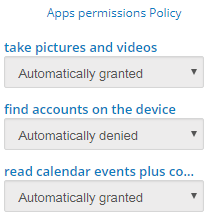 How to manage apps permissions policy? 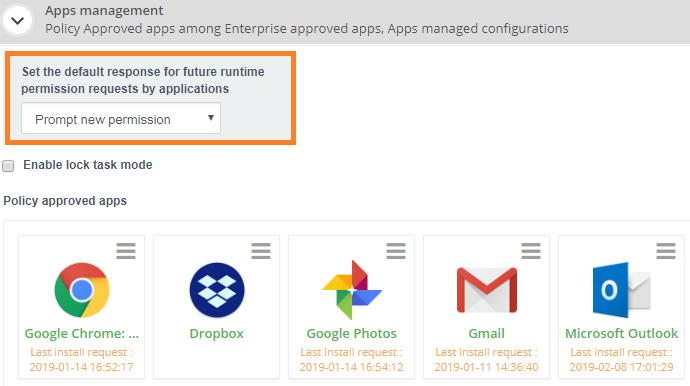 From your admin console, you can set the default response for future runtime permission requests by applications (read contacts, access the camera, read the content…). By default, this is set on “Prompt new permission”, meaning everytime an app will need a permission, it will be asked to the end user through his/her device. By choosing “automatically granted” or “automatically denied”, all future permissions will be directly accepted or forbidden. If you want to manage permissions of each app independently, click on the 三 icon in the top right corner of the app and select Permissions. The list of permissions that could be prompted for this app is shown, and you can choose from here to enabled/disabled them. Please note that if you select “Automatically denied” for one app in particular, this permission will be denied even if you set the global default response for future runtime permission requests to “Automatically granted”.